move our pets safely and in comfort. Each travel kennel is ventilated. 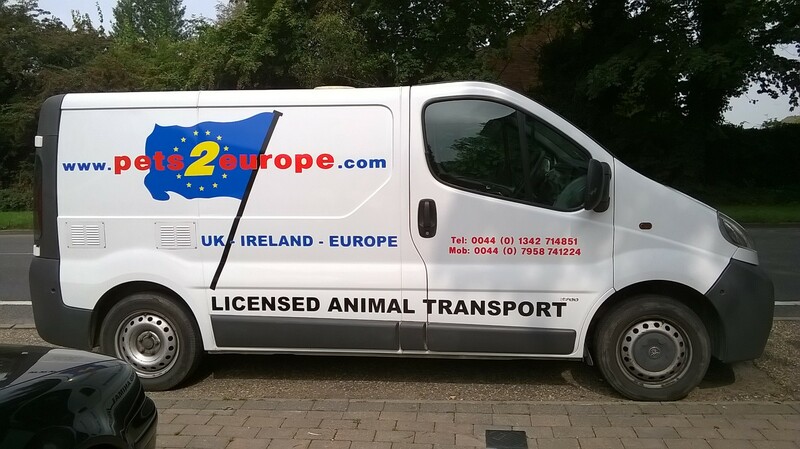 type 2 license to transport animals on journeys in the UK & Europe. All stops are recorded on a DEFRA format delivery note. Your pet can also travel with their own bed or with a favorite small toy. kennel or cattery en-route. Or a pet friendly hotel. we can do to help you . Only use a licensed pet transporter. A license and a DEFRA approved vehicle are legal requirements. There are rules we have to follow to ensure the safety of your pet. Also if someone has invested time and money to get the correct vehicle and license to carry your pet legally, then they are more likely take care of your pet. An unlicensed carrier is not accountable to anyone, so you will be gambling with your pets life and welfare. A licensed carrier will have the correct insurance, if something should go wrong. Carrying animals in an unapproved vehicle is illegal and the animals will not be insured Only, and their road insurance could be invalid as well. By law we must carry our license and vehicle approval certificate in the vehicle at all times, please ask to see them. If you want to check them before booking we are happy to email them to you.